The top picture was taken at Madras University, Marina Campus. I really liked the buildings of this campus, old English Architecture. 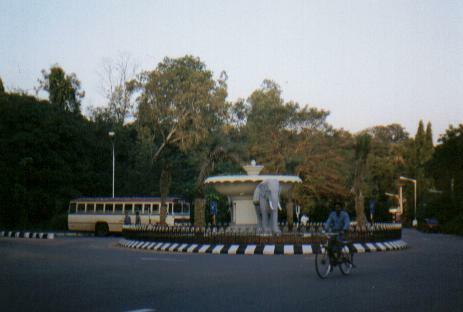 The second photo is Gajendra Circle in Indian Institute of Technology, Madras (IIT-M). 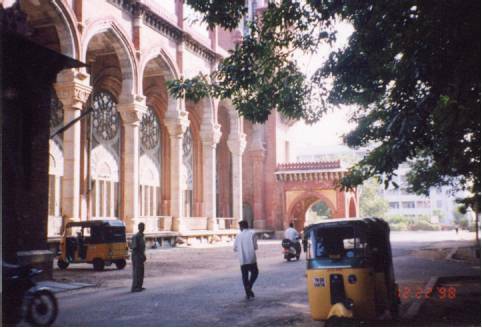 One of the nice things about many universities in Chennai is that they are located inside gated areas, guarded by a watchman and many cars are not allowed inside. So, in addition to not being bothered by beggars, there is no noise or pollution inside these campuses. I find the campuses very peaceful, cool, quiet and beautiful. This page has been visited times since September 2001. Reviewed December 2007.